The relative holding of different anchors has been well tested and written in multitude of publications, but the results are confusing and often not reproducible. The reason for this is BOTTOM. It turns out anchors behave differently in different bottoms. For example in soft silt we found a Danforth or a Fortress offer the best holding (due to their relatively large surface area) and the discussion of setting is irrelevant because all anchors will set in such soft conditions. In thicker (more viscous) bottoms a Danforth will fail to set, it’s blades skipping across the surface, but Spade might have an excellent performance, diving deeper than all others. Put the same Spade in thick clay and it does not set period. This explains why one time an anchor can test excellent and the next the results are disappointing. Further, even in the same locations, the bottom conditions change with varying weather, salinity etc. This often translates in drastic differences in anchor performance. In our usual testing grounds in Galveston Bay, there are days that our test anchors, a 10lb Manson Supreme and 9 lb Rocna set immediately and there are days they do not; while using the same rode, the same technique, and identical location. Given these plethora of variables, any individual test can only be viewed in the greater context of all that were performed previously and the tests of the future. If viewed as a conglomerate, these tests do suggest certain patterns that agree with the experience of many in the cruising community. Rocna, Manson Supreme, Spade, Ultra (new generation anchors) do offer more reliable performance than Danforth, CQR, Delta, Bruce. Therefore, the perfect anchor will set in the widest range of soil bottoms (including thick clay or grass) and have enough surface area to provide adequate holding power even in soft soils. With Mantus we strove to push the envelope of setting ability even further compared to the competition, thereby guarantying the likelihood of a set in even the most challenging bottoms – hard-packed clay/mud and grassy/weedy areas. We extensively tested the Mantus with all its competitors and documented the findings in videos, available at https://www.mantusmarine.com/test-video/ thus you can judge for yourself. So when we claim Mantus is the best all-around anchor, we do not claim pound for pound the best holding power in every sea bottom condition. Mantus is the best setting anchor in a wider range of soils and while it will not match the holding of the same weight Fortress in a silty bottom, when sized appropriately it will hold your boat in a gale even in seafloors with poor holding conditions. When anchoring in a firm bottom it will set in places no other anchor will set and hold better than any anchor on the market. So it shines as the best all-purpose anchor. We designed the Mantus to disassemble for easy stowage. Now you do not have to compromise on your storm anchor choice, the set is guaranteed. 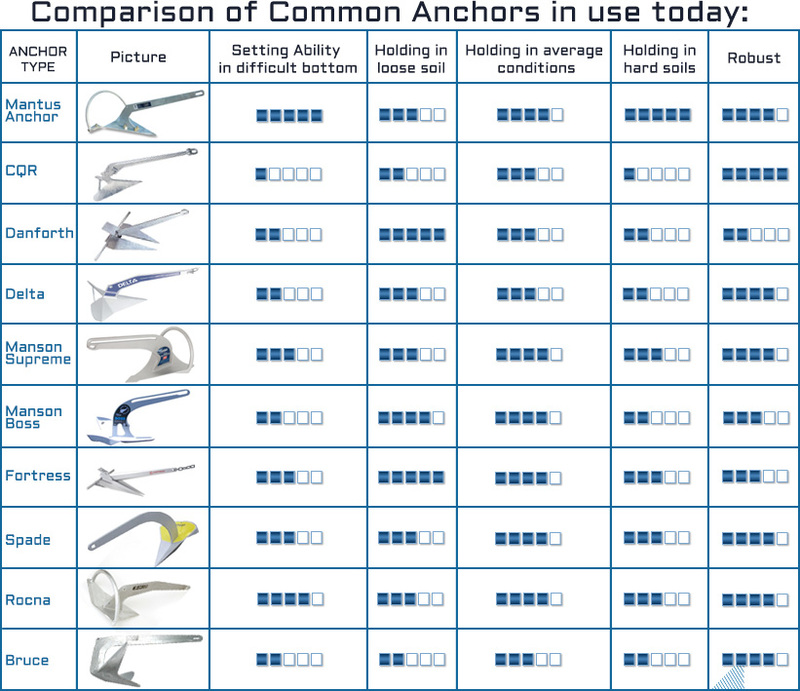 There are other brands of anchors that are popular with boaters that we did not cover in this section. In particular SARCA, ULTRA, KOBRA, BULWAGGA, BRITTANY etc. We wanted to report on anchors that we personally tested and compared head to head with the Mantus Anchor. Thus as we do more hands on testing we will review other brands and incorporate them into the rankings.